Yesterday I finally—finally, as this blanket was begun 2 years ago!—debuted a picnic blanket that was made for me by friends, using materials bought with friends, and that will probably always be used in the company of friends! Two summers ago, Andréa and a few others of us got to talking on Twitter about having our own bee. There’d been a handful of bees amongst knitbloggers already, but this one brought together a new group of crafty folk—some experienced quilters and some novices. My month was right in the middle, and I chose the disappearing 9-patch. On a trip to the burbs with fellow city friends (periodic visits to big box stores are crucial for city survival! And the Santa Fe Salad at the Cheesecake Factory, about the only thing that I truly love about the suburbs), we hit a Joann’s during a 99-cent fat quarters sale, so I stocked up on yellows and oranges with this project in mind. I invited my bee-mates to add their own fabrics (in oranges/reds/yellows, of course) but one rule had to be followed: The center square in the 9-patch had to be in the provided Kona Snow. This way every block would end up with four small white squares. But I wasn’t picky about how the patches were rotated and sewn together (however, any ones that came in with the same fabric next to itself were picked apart and tacked onto another square). When I distributed the blocks I worked to keep the red squares scattered around. I sewed lots more squares to fill out the blanket—it can seat 2–3 people comfortably. I finished the top about 8 months after my bee month, but there it sat while I figured out the backing. I wanted waterproof, or something like it, and wasn’t sure how best to accomplish it. Then while in Boulder for a dear friend’s wedding, in line at a hardware store for sunscreen, I turned and saw large bolts of oilcloth for some amazingly low price (I think less than $2 a yard?). A yellow with green plaid lines seemed to be the right choice, so I bought several yards and smashed it into my suitcase. But I only finally got around to putting it all together a few weeks ago. I didn’t put any batting between the top and backing—I figured, whatever padding I’d put in wouldn’t be any match against a rock, and I certainly wasn’t seeking warmth. But I did quilt the two together, just to be sure there wouldn’t be any shifting. I went on the diagonal in each direction. Stitching on the oilcloth was so easy! It moved through the machine just fine, and I had it all quilted in no time. I used another orange fabric as the binding, and machine sewed it down. This was my first time using the machine, and while it wasn’t a perfect job, it definitely did the trick; I was pleased with how successful it was! While sewing down the binding I added two ties so that I could roll the blanket up and tie it shut. Ingenious, I think! This weekend I got to use the blanket at the Big Apple BBQ. Five friends and I sampled some amazing meats on the lawn at Madison Square Park and relaxed on our blankets—it was perfect! This was my fourth visit to the BABBQ but my first with a truly wonderful blanket to sit on. So big thanks to Sara, Nova, Sarah, Chawne, Kate, Stacey, Danielle, Carrie, Andréa, JulieFrick, and Caro for your contributions to my summer of fun with friends! I love that I can have my friends with me in so many ways. Just do not spill anything on my quilt, or I’m never hanging out with you again. You’ve been warned! 12 Responses to twitter bee picnic blanket! 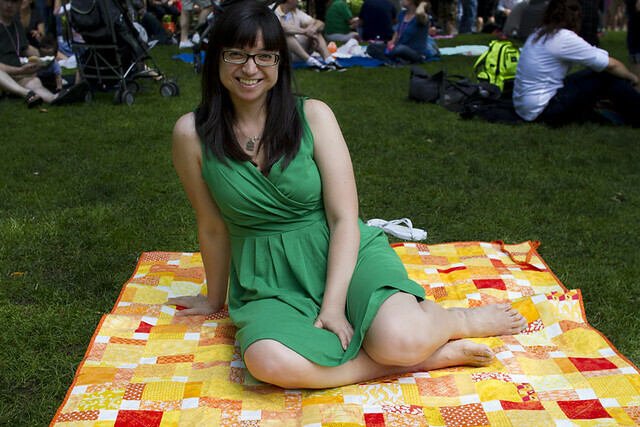 Love the picnic quilt and that dress is the perfect compliment! Wow, that quilt is beautiful! It’s really fantastic – I’ve admired it for some time and I think I need a yellow-orange-red quilt. oh, what a happy, juicy quilt! i love those citrus-y colors. congrats! Hello, Awesome! I love it! Wow, that is really gorgeous. I just learned how to sew, and perhaps someday I can aspire to something so phenomenal! That is the happiest, summeriest blanket EVER. Summery goodness all over! Wish we had picnic weather in the UK. Oh & your dress is great too. The ties, are inspired. As ever, your eye for detail is the best. it looks fantastic. can’t wait to see it in person.